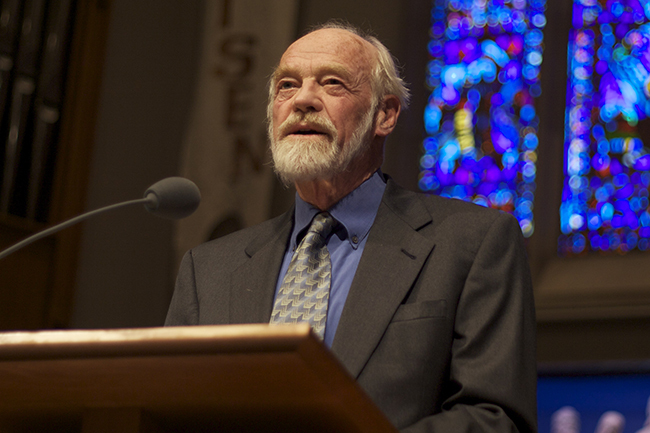 Pastor and author Eugene Peterson died on Monday, October 22, 2018. He was 85. For those who knew him, Peterson’s life embodied the title of one of his most famous works—A Long Obedience in the Same Direction. During the previous days, it was apparent that he was navigating the thin and sacred space between earth and heaven. We overheard him speaking to people we can only presume were welcoming him into paradise. There may have even been a time or two when he accessed his Pentecostal roots and spoke in tongues as well. It feels fitting that his death came on a Monday, the day of the week he always honored as a Sabbath during his years as a pastor. After a lifetime of faithful service to the church—running the race with gusto—it is reassuring to know that Eugene has now entered into the fullness of the Kingdom of God and has been embraced by eternal Sabbath. Peterson founded Christ Our King Presbyterian Church in Bel Air, Maryland, in 1962. He served there for 29 years before retiring in 1991. He became a professor at Regent College in Vancouver, British Columbia, until retiring from there in 2006. He was the author of more than 30 works, including The Jesus Way and his last book As Kingfishers Catch Fire. Peterson also translated The Message, a paraphrased version of the Bible.